From, well, it’s in a couple of different episodes, I guess. I took this shot from the last episode, but it’s reused footage from an earlier instalment. Tatami Galaxy is an interesting show. Whilst I wouldn’t necessarily call it a dense show, it’s more demanding viewing that most anime shows. It’s not something you can watch semi-passively in the same way I end up watching most shows, if only because our protagonists narration runs at such a high clip that a mere momentary lapse in concentration results in the loss of information. It’s also one of those shows which can make you feel kind of bad about criticizing. I don’t necessarily mean it’s a bad show, but I do think it’s one which would have benefited from a format differing from a TV show, even at the truncated noitaminA length of just eleven episodes. The middle stretch in particular, where if runs through several episodes which utilises a much narrower branch of variation in it’s time-repetition story than those which proceeded it, tried attention a little. It’s difficult not to think that the show may have benefited from a smaller number of episodes, perhaps at a longer length than standard duration. Alas, shows of such a format rarely get made these days, so I suppose that you need to take what you can get. It’s difficult to criticize, however, because it’s rather different. It’s kind of the Tiger and Bunny thing where people seem to have a habit of over-inflating it’s quality because it’s scratching an itch that has been long neglected. Not only is it not derivative of anything else that’s getting made in anime (at least in mass), but it’s tries to do it with a modicum of intelligence. It’s easy to slag off a lot of other anime, regardless of their actual quality simply because it’s really easy to be cynical about it – you can see the marketing hooks, the characters it’s trying to get you attached to, and the merchandising it’s trying to get you to buy. 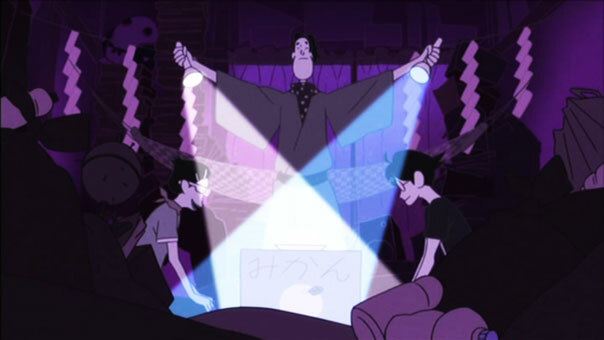 Tatami Galaxy, on the other hand. Well, it’s not like Maasaki Yuasa is the only anime director whose works are rich in peculiar visual metaphors, but the likes of Ikuhara at least straddle a middle ground. Penguin Drum and Utena both have cute character designs and a broad sense of humour. Tatami has weirdness, interesting animation and a rather high-level sense of humour that many probably won’t get. If you don’t get what’s going on in Utena (and I have to admit, I’m a little too dumb to follow much of it’s final arc, or at least I was when I last watched it many moons ago), there’s something else for you to enjoy if, like the cool swordfights. If you don’t get Tatami Galaxy, well, I guess it at least spells out it’s point in it’s ninth episode (though, really, that’s probably more of a negative). Not unlike an episode of Tatami Galaxy, I’m rather somewhat rambling here. I think my point was that, whilst I really rather enjoyed Tatami Galaxy, I’m really not sure how much of that comes down to genuine quality, and how much of it was pure novelty value. But I’m not sure. Because I’m dumb.